Identified in Catherine Hollan's work Philadelphia Silversmiths as a member of "the extended Butler-Peters-McCarthy families from New London, CT," James Butler established himself in Philadephia and became closely associated with that city's James Watts with whom he was actually in active partnership as Watts & Butler for one year, 1867. Butler also used an animal head over chevron emblem, as found on this 7 1/8" long, T. oz., preserve spoon, that is similar enough to that used by Watts as to create confusion between the two. This is additionally stamped "Coin." 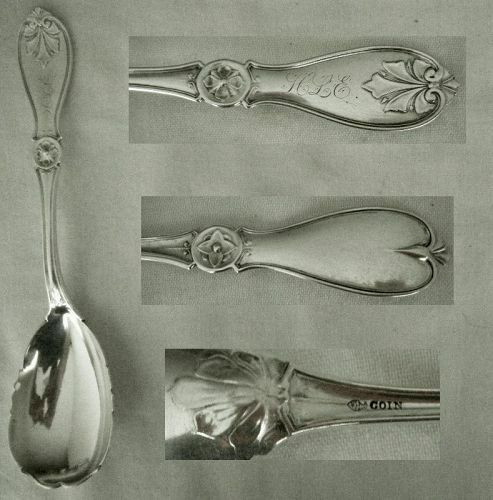 While known for his engraved patterns, this is an unnamed die struck design and incorporates a leaf with anthemion tip on the end of the handle, a rosette set midway, and lastly another small leaf at the join with the bowl. The handle reverse incorporates another rosette, albeit differently styled from the one on the front, and an anthemion tip but without a leaf. The bowl is ovoid with a plain interior and scalloped edges, and repeats a leaf detail on the backside heel. There is a feathered script "HLE" monogram set sideways on the handle front. In excellent condition, it retains clear pattern detail, showing no polishing wear and having a fine finish. The bowl is free of dents, nicks, cracks, or burrs.